Shirdi Sai Baba Stories,Leelas and Teachings. 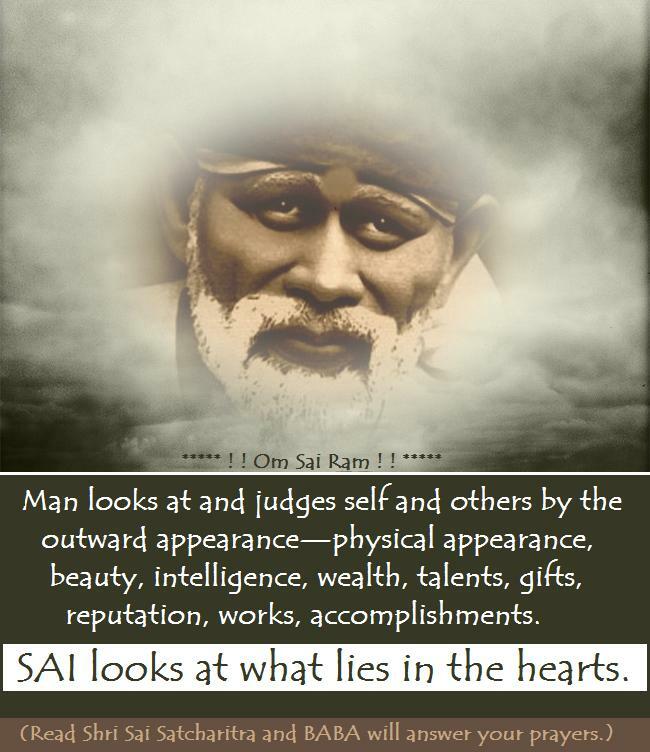 : Shirdi Sai Baba's Grace-Experience Of Sai Devotees-Part 24. 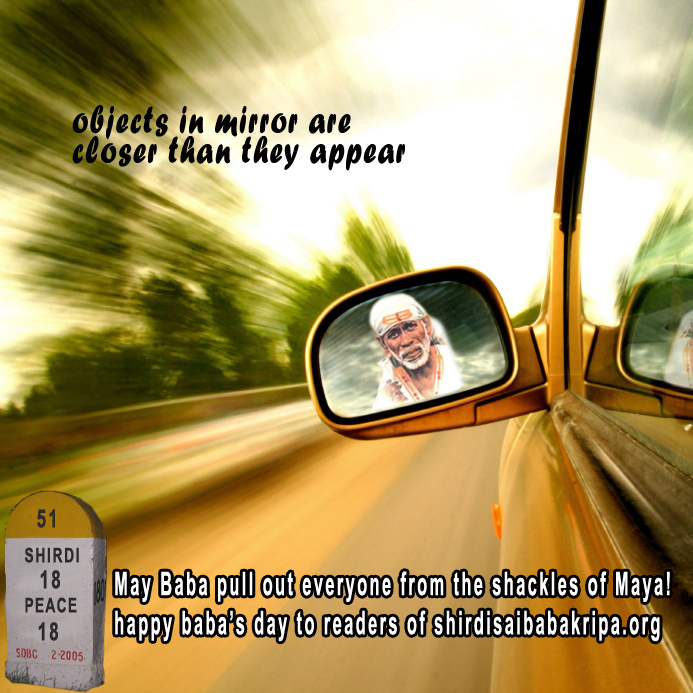 Shirdi Sai Baba's Grace-Experience Of Sai Devotees-Part 24. Different kind of Sai experiences are shared today .Witnessing Baba's answer for different situation is what is highlighted in all the shared leela's.Sai children sooner or later realise that Baba never turns His children empty hand but bless them at right time according to what He thinks is best for them . First and second experience is shared by one of the website's regular reader. I am sharing the photo's shared by the same devotee .The first picture is an attempt by devotee followed by another leela where 5 photo's are attached as e-mailed. 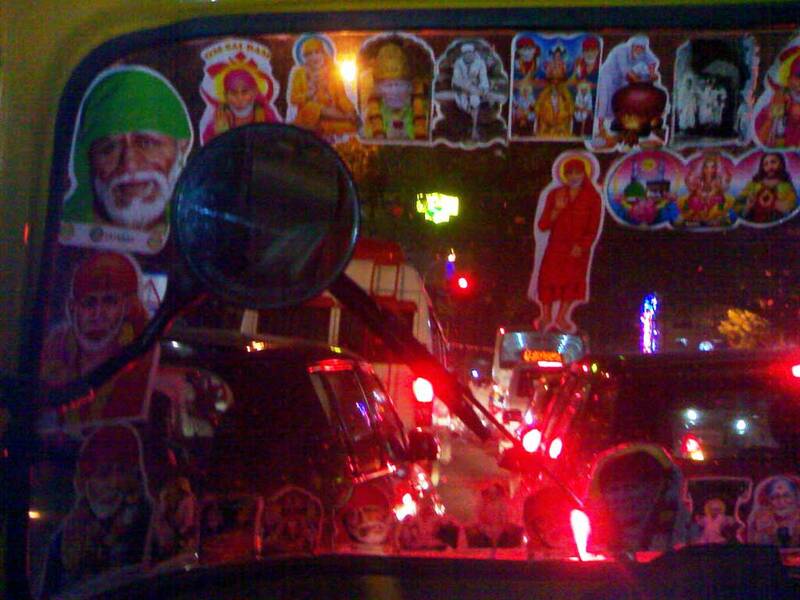 I feel I had never seem so many Sai Baba's photo in one place !!! It must have been a amazing feeling for the devotee witnessing this along with Baba's blessing on nick of time.Like this each Sai experience shared below has touch of Baba's presence and His silent answer at right time to them .Jai Sai Ram . At baba's will, please share this leela. This is no less than a leela to me. After seeing many designs with regard to shirdi sai, myself also desired to do one. But i know little usage in these methods. Once when i thought of doing something special, my mind was blank. 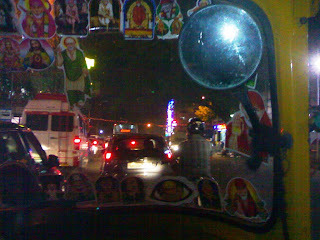 The moment i prayed to Shri Sai for help, without any idea, i landed in a picture of car in google with mirror in focus. To say... the image attracted me is not right but baba chose that picture through me within seconds and triggered the idea and rest all is the result with the work attached herewith. In this picture- in the Milestone, 51 denotes- chapters of Shri Satcharitha. 18 denotes - 1918 samadhi year of Sai Baba. I showed to my family of baba's hand in this work. My brother was taken aback at this but my father thought a while and fine tuned and told me NOT to put Moksha as common man will become scary of the word, unless it is understood properly indepth. So baba suggested the word PEACE through my father. It is all ''Smilestone'' now. All praises to Baba and Sai only did this work for me. I could clearly experience this. Even to our little desires and prayers, baba fulfils them in a very unexpected way through ourselves. That is how Shirdi Sai is special to everyone. Whether He helps or not on certain occasions due to karmic interferences, everyone likes HIM irrespective of their situation. This is the Greatness of the phenomenon ruling the universe called GOD ! God is the only factor which is protecting the humans, creatures and nature. Sai is the God, the Saviour, who sees all equally beyond caste, creed, color, religion, poor, rich, down trodden, diseased and treats them with mercy and kindess. 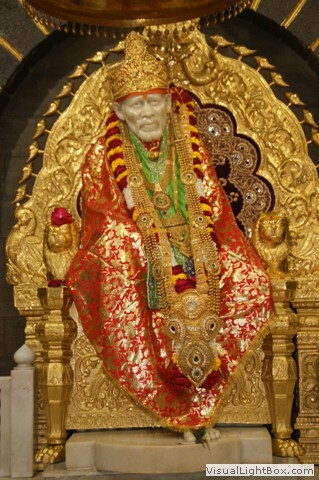 Shirdi Sai's "Satcharitha" preaches love and shun hatred which is the cause of chaotic life everywhere in the world. When one finds peace in himself/herself, they can achieve the impossible. To practise peace, one should develop kindness towards all and spread the vibrations of goodness around them. May baba bless every individual and creature with peace, unity and benevolence. 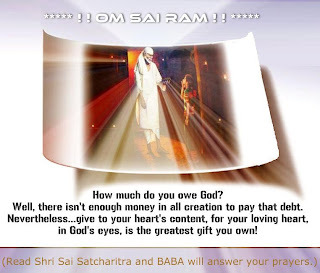 Bow to Sai, Peace be to all. With Baba's will, please share this exciting experience. Yesterday i emailed to you enquiring your's and family's wellness and to know about some albums and placing my concerns etc. briefing about karma and destiny despite baba helping us. I finished mailing but was worried about situations here. In the late evening, i came to main road, to go to an optician to collect my father's spectacles and was looking for auto. It was dark due to winter and not much light on the road. One auto was slowing down by my side and crossed me. I quickly walked behind the auto and called it. The driver peeped out to ask the location. I told him the same and was afraid for he will ask Rs.80/- or 100/- owing to heavy traffic for that distance. Usually the charge is 80/- for such distances and it is of higher rate. Either you have to proceed or find other modes of transport which is time consuming. To my surprise, he smiled and asked 50/- rupees only. I immediately remembered our beloved baba and thanked Sai heartily. 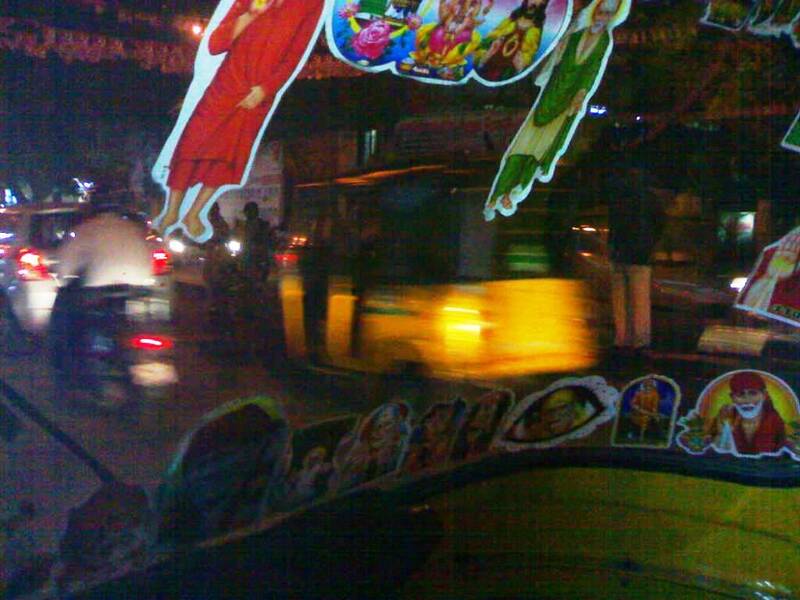 I bent inside and sat comfortably in the auto to look for outside. The front portion of the auto will speak a lot for itself. I was excited and took the mobile and asked the driver to move a bit and clicked to my heart's content. Tears rolled down. (Sai Sat Charitha's lingo). It is due to my merits in past births that this auto came to pick me when i was greatly worried about family's situation ;). The greater the worries the more of SAI in numbers. Please share the five photos attached herewith. 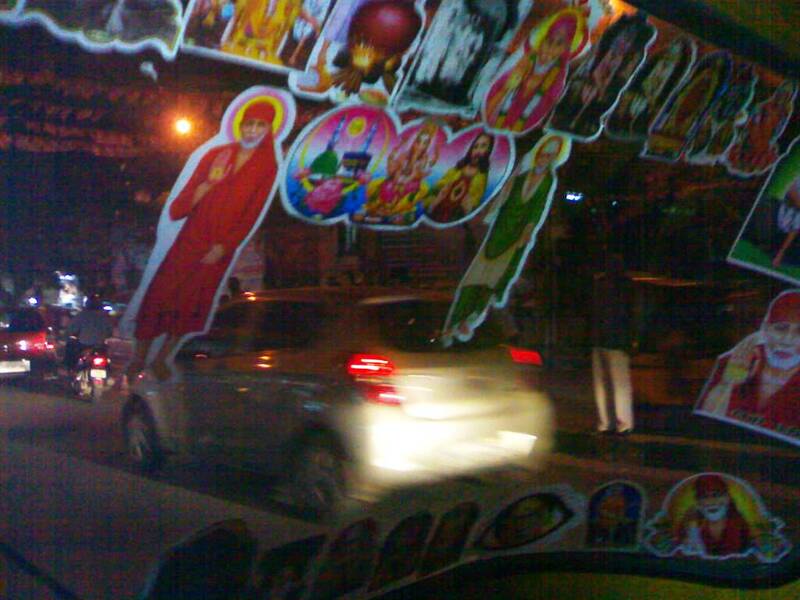 The driver is a Shirdi Sai devotee. But shocked as well as happy to see so many bordering of auto with babas roop. 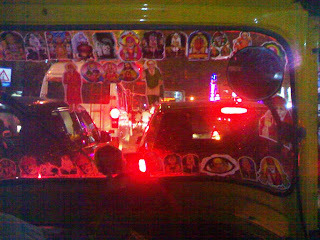 Very nice driver and when i got down, to thank baba and the driver, myself voluntarily paid Rs.60/- and he thanked me in return. Wonderful miracle of sorts so far, in the ways blessed by baba. I gained hope to think baba is there for His devotees everywhere. Sincere remembrance and devotion is the need for any Sai devotee and for any non-sai devotee also to their favorite god. How are you and all at home ?Please kindly post my below experience in your website. For the past 2 weeks my mom is suffering from chest pain and giddiness.Last week my mom consult my family doctor.He asked her to take ECG .The result is showing that there is some problem in her heart.So I was very much worried.We took an appointment with a cardiologist last week and they gave us an appointment on Dec 20th . For the past 1 week I prayed Sai and gave her "Sai Udi" mixed with water daily before going to bed.Today before starting to hospital I gave Udi mixed with water to my mom and then we went to the cardiologist .I asked my mom to do "AUM SAIRAM" naam jab during each test and I also did the same. They did the first test which is ECG test and the result is a miracle which is showing normal.Then they test for sugar,salt,urea and cholestrol level and the result for all is normal.Finally they took thread mill test and echo scan test and due to our sai's grace the result was normal. Manisha sister ,Kindly correct if there is any mistake before posting the miracle. Acknowledgement:Best Live Darshan of my Life. Thank you all brothers and sisters, Feel like a one great family while reading experiences of all. Some great sole once said "You need not have anxiety to search for a Sadguru, HE recognizes bhakti from HIS place and pulls you to HIM", Same happens with all of us. 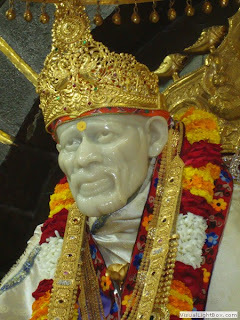 Yesterday Friday (9th Dec'11), I had opportunity to visit Shirdi. As everybody does, I too had some serious things in mind this time for me and family from BABA but this time I wanted immediate acknowledgement. When reached near Samadhi, was expecting for a flower from priest without asking for it. Guy in front of me had his hands spread for same, but I didn't wish to do that, just wanted to happen on its own but security drove me as normally happens. So, went a little back and turned around for darshan, within ten seconds security person came hastily and drove other people in front of me and I expected he will do the same for me too as thats his job he has to do. But HE STRAIGHT AWAY STOOD IN FRONT OF ME AND said "SAIRAM" GAVE ME A saffron coloured 'RUMAL' (KERCHIEF) WITH BABAS PICTURE ON IT and said BABA SENT THIS and I had nothing else to say and do but tears starting flowing nonstop and goosebumps all over. My experiences with Sai Baba. I wanted to share a couple of my experiences even though i have experiences with Baba day in and out. My Life took a whole new direction in past two years, especially last six months. I remember praying to Baba Sai since 2002. As I said, it was in last 2-3 years that my life was in trouble due to the sadesati that just started. I lost my job in Nov 2008 and ever since I see only troubles. I could get a job in a MNC in Aug, 2009 but due to Saturn I ended up in a mess in the first month of the job and was terminated. They were even thinking of pressing criminal charges on me for using company documents for personal use. I know I did a mistake, but Baba still helped me here. In one hour with Baba blessings, the company's attorney changed their mind and let me go free. However, I had no job but I was happy it could have been far worse. I thanked Baba for saving me from deep trouble. Time flew by, and it was in Feb 2010, I first came to know of Sai Satcharitra (all these years I have no idea of parãyanam) through my cousin. I read the book for 3 times and got a job in a new field of my choice and to tell you guys, I was offered the job without any interview. It was sheer miracle as I walked in first day since I was out of job for a good year. In a month into the job, with Baba's blessings I got a better job in westcoast and was working happily for 6 months. I was hired as temporary but got permanent in 2 months in to the job. Life went well for 5 months, after which my boss suddenly told me that she doesn’t like my work and I have only one month to improve. However, she was adamant even though I was working hard and improved a lot. One fine day, I was let go. I asked Baba why this has happened. It was the same boss, who praised me for my work who changed her mind. I was on a student visa and was working fulltime during these jobs. I read Sai Satcharitra for two times and asked Baba that I should have a job in 15 days. It was a miracle that I had a offer in only 10 days from the day I was let go. And guys, the new job is at a place 5 miles from my old place where I initially moved from to west coast. Then I moved to my old place and started working. But still, Saturn was in full effect and I have to quit the job after 3 months in Jan 2011 due to visa issues. I have come close to being deported. Again, baba helped me and is taking care of the problem. This could not have happened if i was in west coast. Baba has a bigger picture in mind and knows what is coming in future. I am back to work with Baba's miracle after 6 months . I have still couple of problems to be solved by Baba but Baba is asking me to be patient and HE will take care of them soon. I will come back and write experience in full once I get those issues solved. 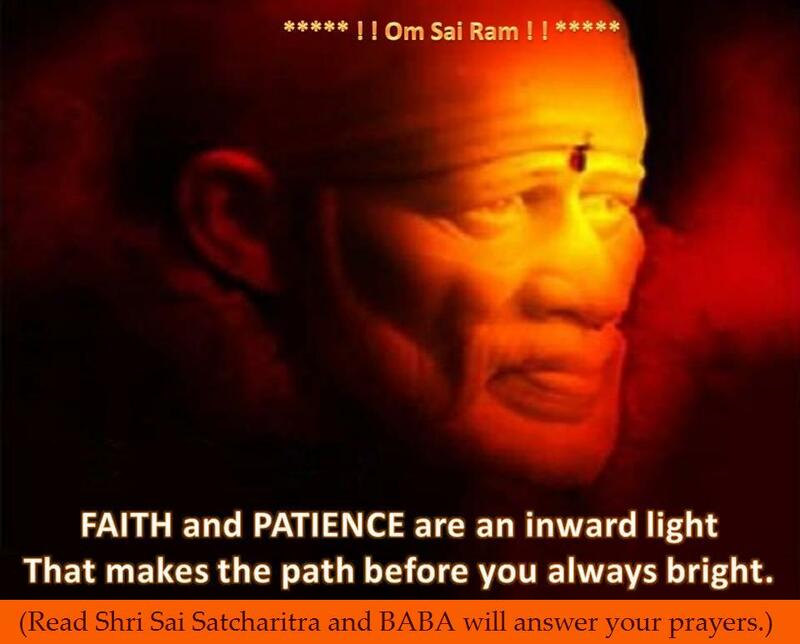 I pray baba every day to attend my left over issues so that I can be a happy full time Sai Sevak all my life. And forget to tell you, in last six months I become a fulltime devotee, volunteering in a temple, quitting all bad habits, being strictly vegetarian including not eating egg. This is a miracle in itself for changing me so much that even my parents and friends wonder how so much change occurred in me. I even encourage my friends and preach my parents about the life’s purpose and ask them to change their habits. A very big thank you for such a wonderful platform where we can read abt our baba and all Sai experiences. I believe in Baba right from school days .Baba's kripa is always on me . To day I want to share baba 's kripa on us . My daughter has an birth injury on her shoulder due to doctor's wrong decision .we have been to many doctors every one said we have to wait and see meanwhile go to therapy so, we were doing therapy and I was praying god to take care of little one and slowly she started recovering and started moving her hand and got some range of movements in her hand . Though she could use her hand she had some limited range of motion in her injured arm and I was always worried about that. All of a sudden we decided to move to USA I was in hope we could find some treatment for her. After moving to US we went to baba temple for our car pooja . Here I should tell u all that after my marriage we were in different countries so I couldn't go to baba temples .now I feel that Baba brought me here so I can be friends with Baba's devotees and I can always be under his sharan . 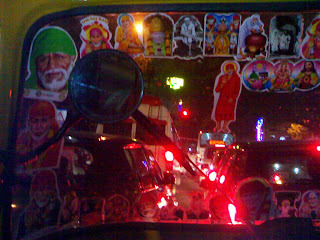 After that I met a lady who is an ardent devotee of Baba now she is a very good friend of mine .From her I learnt about 9 weeks Sai Vrat and I stated going to baba temple regularly and reading satchrithra .I was always praying baba to show us a way meanwhile we been going to diff doctors but all of them said she is ok put her in some activites where she can use her both hands . Baba has showed us solution .I went to dance teacher to put my daughter in dance class .My daughter loves dancing and she is very good at it .I had to tell dance teacher about my daughter's hand and there baba gave us a solution when teacher heard about her problem she said her friends's daughter had similar problem and one of the doctor invented a new procedure of surgery to arm and she is alright now.So, we met her friend, got doctors details and my daughter had two surgeries from that doctor ,everything went well my daughter is doing good by Baba's grace and His blessings . She is on therapy now ,still waiting for her to gain full range of motion I am sure Baba will make her hand normal and she will get full range of motion .I went to dance teacher after I finished my 9 week Sai vrat and baba showed us a way .I came across this website when my daughter had second surgery and I was in lot of tension i was so relieved and peaceful after going through some of devotees experiences .I made a promise that I will post my experience once my daughter is ok I am waiting with Saburi( patience) to see my daughters hand to be functionally normal. My daughter with out applying udi on her forehead she don't go to sleep she is also a Baba devotee now . Beautiful pictures of baba .Never saw so many photo in a public taxi. Devotee is blessed .